My children are performing in this theatre production this fall. It's quite an adventure for the whole family. Some of the moms suggested that I try stamping out a disc to celebrate our achievements. Voila. 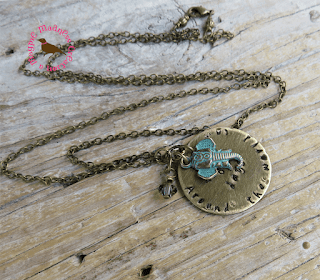 I hand stamped Around the World in 80 days on both a 1.25"and 1" brass discs, antiqued and distressed the disc and added a bronze Eiffel tower charm and sparkling Swarovski crystal for a cluster pendant necklace. Charming. 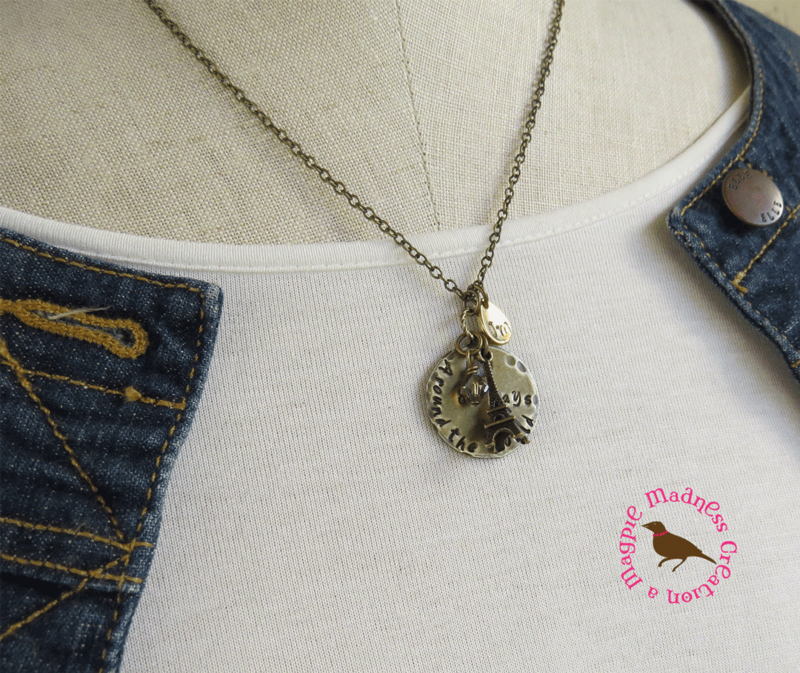 Other charm options would be an antiqued open book, key (not shown), boot, arrow, and now a verdigris elephant. Add on a side teardrop tag with your child's initials. Brass chain is antiqued brass and wears well. Crystal is Swarovski. Chains are finished adjacent to the lobster clasp with tiny beads. 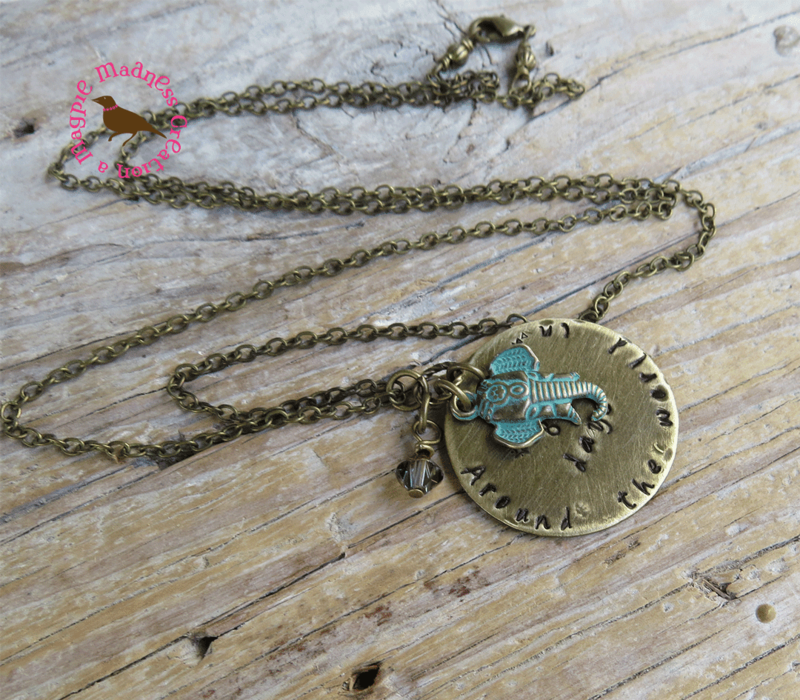 Discs are hand stamped by me in a delightful "not-perfect" style:) Charms are antiqued bronze. 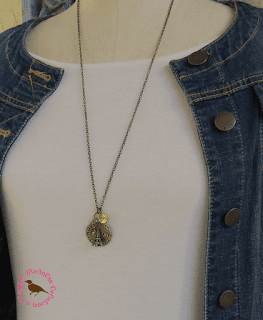 Necklaces measure 30 inches to the pendant then falls an additional 1.25 inch. Let me know if you want a shorter chain!!!! Have a dude who just might not want a necklace? What about a keychain? See necklace with larger 1.25" disc here and the smaller 1"disc here. Come see one of our performances November 10-12th! !